The village sign is made to represent the villages many constitute parts. Starting with the roundels, the cross keys represent St Peters church sadly now a ruin with just a part of the tower standing as a listed building. The other roundel with a white cross represents our remaining church of St Andrew watching sedately over the village in the high street. 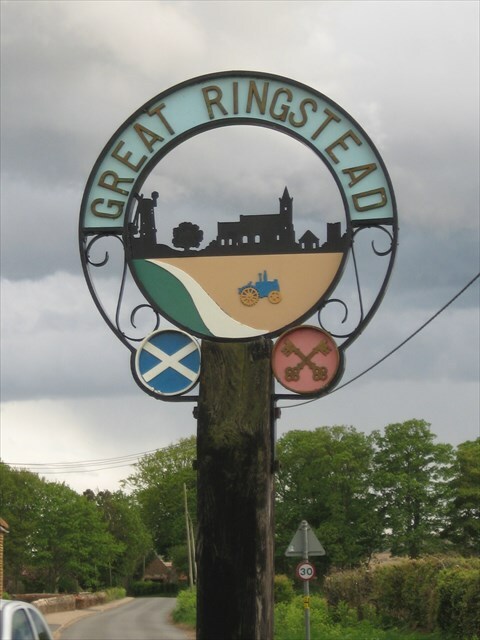 Moving up the sign we come to the central area depicting on the lower left in beige the main cereal crop at the time of manufacture, barley, then a white line representing Ringstead's position on Peddars Way. To the right of Peddars Way the green area depicts the other main crop at the time, sugar beet. A vintage tractor symbolizing the villages long standing farming traditions completes the lower portion of the inner circle. At the top of the inner circle starting from the left is St Peters tower, the chapel, St Andrews church, Queen Victoria's golden jubilee tree and the windmill are depicted. The inner circle symbolises the main village and the outer circle represents the outer fringes of the parish. Our much photographed village sign was designed by Mr W. Joyce who gave it to the parish as a gift. Mr Joyce started work on it in 1996 and worked tirelessly on it until its erection on August 9th 1997 with a very small band of helpers . A time capsule was placed within the base of the sign at the time of erection containing all the coins of the realm for that year, a news paper banner and a description in a glass bottle. A small plaque on the side of the sign states that the parish council erected it, however it seem's that this may not be the case. However the parish council holds responsibility for its upkeep . In all the time since its erection and dedication, only once has it had to go away for refurbishment. The work being done free of charge by Wayland Prison.